This week on A Sound Effect, we have libraries that are as interesting as they are useful. If you’re looking for game audio, we have three new collections that feature retro 8-bit sounds, sandbox crafting foley and effects, and adventurous fantasy RPG elements. We also have unique impulse responses and cinematic guitars that will take your audience for a loop. And if you’re looking for something more true to life, we have libraries that feature geysers, dump trucks, Italian atmospheres, and a stockpile of residential and urban ambiences that will likely find themselves on your DAW’s timeline for years to come. Enjoy! The A Sound Effect summer sale is in full swing – and if you feel like saving up to 70% on astonishing SFX libraries from the sound community, here’s your chance! Welcome to this sonic tribute to the world of builder games. Take this tidy sound pack on a fun, cartoon adventure and you’ll be backpacking with 625+ game inspired sounds and effects that your audience/users will love, enjoy and thank you for. Your pack is complete with bubbly items and collects, designed cute UI, cartoon creatures, door opens, closes in many styles like treasure chests, apothecary cabinets, wooden and more. It also includes liquid elixir potions, drinks and bubble pops, explosions, fireworks for maximum celebration and epic-ness in your game – torches, fire starters, digging, mining, magic twinkles and poofs, unlocks, enchants, buffs, Bows, footsteps and more! Don’t forget the Material Break, and Tool section. Inspired by the sounds of the popular game Minecraft, Builder Game’s Tool and Material break section gives you the essentials for breaking a variety of materials, building supplies for crafting your sandbox world to perfection. 'Builder Game' by Epic Stock Media gets you an all-in-one library focused on this addicting game genre. With over 625 sounds, you'll have the components to put some sonic magic in your sandbox world. With sounds of torches, fire starters, digging and mining, tools, materials, and footsteps, your game will have satisfying audio for all your gameplay elements. You'll also hear snappy user interface sounds, cute creatures, pops and explosions, twinkles, buffs, and much more! For a library with charm and personality, definitely give this one a listen. Get almost 5 hours of sounds of Sicily, Italy – captured at various locations during different times of the day. The library features sounds of both empty and crowded streets. Mornings and nights sounded different from siesta time, that’s why I’ve recorded streets during all those times. Another location was a fish market recorded in the morning, during most intense moments. Other files covers the traffic on the streets full of honking scooters, barking dogs and just cars passing by. In addition to the recordings from Trapani, you’ll find sound of the airports, not only in Italy but also in Poland, which contains both Polish and Italian walla. Walla sounds varies from ones with a lot of people talking from different directions, to more narrow ones, with small groups speaking from one place. Most of the recordings are not that easy to distinguish, but there are also files where you can hear very clearly every word. Italy – Sicilian Ambients features 36 WAV files, recorded with two 8040s plugged into Sound Devices 702 and Sony PCM-M10 portable recorder. The total length of the files is 321 minutes. 'Italy – Sicilian Ambients' by Soundholder is a collection of ambiences from Trapani with the romantic elements you've come to expect from movies or perhaps your own holidays. Featuring over 5 hours of recordings, you'll hear busy fish markets, honking scooters, seaside birds, uppity chickens, ringing church bells, barking dogs, and Italian walla that ranges from unintelligible to almost eavesdropping. To help you find a fitting atmosphere, the city was also captured at day and night. For sounds of a beautiful city, you won't find a more bella collezione. Dumpster Truck (Skiploader) delivers the sounds of a DAF CF 75.310 mid-size truck that delivers open steel containers. They are mostly used to collect debris, junk or discarded furnishings. Once these containers filled up, the truck picks them up again to bring them to the suburban garbage dump. This includes sounds of container dumps, noises from load chains and their locking mechanisms as well as sound from the truck itself (interior, door slaps, air pressure system, wheel noises, 7.5l 310hp diesel engine, exhaust and much more). When you buy a library from Detunized, you get the chance to listen to the world from the perspective of Stephan Marche. In his newest library, 'Dumpster Truck / Skiploader', you will hear over 100 sounds of a dump truck from all sorts of interesting angles. You'll hear the vehicle's hydraulic pump as it lifts and dumps steel containers from the inside and outside, and you'll also hear sounds of the engine revving, foley of the doors, horns, windows and ignition, rattling load chains and carabiner hooks, and even sounds from underneath the dump truck. This library will make you look at dump trucks in a new way. 'Game Jingles & 8-bit SFX' by WOW Sound gives you retro-inspired sound effects for a video game aesthetic that never seems to lose its charm. With over 170 sounds, you'll get user interface sounds like clicks, confirmations, errors, notifications, and alarms all with their shiny, chip-tune sounds. You'll also get lots of arcade-inspired jingles that will reward your players or tell them to try again. Whether you're in the prototyping phase or looking for final tracks, check this one out. 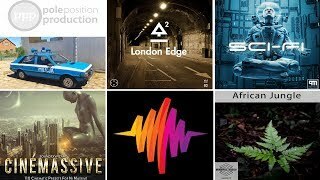 Each SFX library in the “Collected Ambiences” series features 33 Stereo Ambiences from many different locations. The series includes ambiences such as Public Spaces, Roomtones, Drones, Forests, City, Train, Bus ride, Rain and many (many!) more. All recorded with Sound Devices 744T, Sennheiser MKh8040 ORTF, Beyerdynamic MC930 ORTF, RODE NT4 or Sony PCM-D100. All files were cleaned, edited and most of the files loop seamlessly. Please check the Content Lists below for each library to see what the full list of ambiences in each library – and if you get all 10 Collections together, you land some great savings compared to the individual collection prices. 'Collected Ambiences' by SoundBits now contains 10 volumes of sound effects from all over city and suburban areas. Each library features 33 stereo ambiences from places like train stations, supermarkets, construction sites, fairs, plazas, forests, school yards, gyms, food courts, shopping malls, farms, and much more! You'll even hear airplanes landing and taking off, fireworks, drones, traffic, creeks, and wind for those extra elements you need. 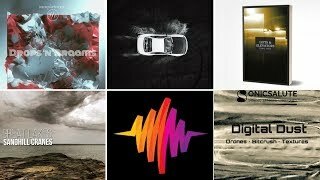 For over 16 hours of ambiences, this collection will give you plenty to work with. Need to create suspense, tension and movement in your production? AXmos Cinematic Guitars is great for you. Atmospheric elements, crazy chords, impacts, movements, reverses, soundscapes, distorted melodies, musical sound design and transitions are some of the things you will find in this collection, produced using a stratocaster type electric guitar. For that reason the sounds have a deep and musical feeling with such versatility that you can use them as effects or to enhance musical productions, generate a sound design musical moment and even compose tracks. Apart of being a great library for Horror or Sci-fi games and movies, this collection is great for trailers too. 'AXmos_Cinematic Guitars' by MatiasMacSD is a unique library that will make you say, 'This is what I was looking for!' You'll hear electric guitars wail straight into your subconscious with chilling chords, impacts, distorted melodies, transitions, and different effects. With 150 files and over an hour of content, this collection is ready to put an interesting edge on your horror and sci-fi projects and trailers. Give the demo a listen to be taken to a dark, new world. Impulse is a collection of “designed” impulse responses to expand your design palate, featuring a wide variety of metallic, wooden, glass, and icy reverbs, as well as some delays and effects. The IR included in this collection are unique “spaces” to help you take your sound design to different realms and planes of being. Why settle for just practical, real-world spaces, when you can explore the blurred lines between reality and fiction? Film, tv, and internet productions are exploring realms between conscious reality and the unknown – this library seeks to help you on those journeys. Whether you’re looking for metallic, wooden, glassy, icy or even watery spaces – look no further. There are small, claustrophobic, metallic spaces; huge, thunderous spaces fit for a Greek god; icy castles only Superman could live in; strange delays that will have you bouncing around the room in a straight jacket; and crazy effects that will make you question your sanity. 'Impulse' by Soundopolis is a collection of impulse responses that will take your sound design out of this world. With short, medium and long reverbs, as well as delays and echoes, you can transport your audience to strange new places like the inside of an armory, a fantastical ice castle, or a 'cavern of whispers'. You'll also get lengthy abstract IRs like 'Daemons Breath' and 'Poseidons Fury' and delays and effects with textures of metal, wood, glass, and ice. If you're still not sure if it's right for you, check out the very informative demo! More than 500 sound effects inspired by hit computer games like World of Warcraft, and Diablo. Tell your story, equip your quest and outfit the adventures in your fantasy world with imaginative and immersive sounds, effects and creative crafted audio. Fantasy Game empowers today’s game developers, audio remixers, sound designers engineers, DJs and even game oriented modern podcasters with an ultra exciting collection of designed sounds derived from stunning 192k source recordings. Perhaps you're not making a retro game or a sandbox builder, but something with a little more plot and lore? 'Fantasy Game' by Epic Stock Media could be what you're seeking. With over 500 sounds inspired by games like World of Warcraft and Diablo, this library has magic, weapons, UI sounds, fire, foley, footsteps, growls and grunts, crafting sounds, and more. Plus, it has several takes of each sound, and it may even help you find SFX you hadn't thought of yet! For an immersive and adventurous library that will get your RPG well on its way, check out this library. Faunethic's Volcanic Geyser sound library is a unique collection of 21 sounds from the bowels of the earth. Steaming, splashing and muddy textures, these sounds has been recorded at San Pedro de Atacama, in northern Chile. The third most important geothermal spot on earth, San Pedro de Atacama is located between 4500 to 5200 meters above sea level offering a wide and beautiful sonic diversity to its visitors. This collection provides authentic sound recordings, captured with high-quality equipment: DPA, Neumann and 4minX. All Faunethic tracks includes metadata carefully edited with Soundminer. All these sounds are delivered at 24/96Khz .wav files. This collection come in easily downloadable zip file. The sound designers at Faunethic have found yet another treasure in their world-wide travels - this time in San Pedro de Atacama in northern Chile. 'Volcanic Geyser' captures the steaming, muddy goodness that spouts from these natural wonders. With 21 sounds ranging from 20 seconds to two and a half minutes, you'll hear the geysers' spurts, bubbles, burps, and eruptions for a library that could voice your monsters, creepy ambiences - or simply your documentary on geysers. Whether you need realistic splatters or SFX with a strange familiarity, this library will make your design memorable. *BUZZZZ* Left your phone in your pocket? On the tile floor? Under a pile of your roommate's disgusting laundry? Locate it with these 17 audio files, recorded in various locations using a customized vibration pattern. The War Zone sound effects library gets you whooshes, debris, cannon shots, beeps, countdown, explosions – ready to be used as they are in your projects, or layered to create complex war ambiences. A total of 170 sound effects are included, categorized into beeps, explosions, beeping mine explosions, debris, low whooshes, whooshes, shots and whooshes + debris. 20 libraries of production elements and soundscapes suited to all forms of broadcast media. From glitched-out future computers to dark, ominous atmospheres, these libraries feature organic elements, analogue source material and extreme digital processing for a blend of the familiar and the experimental side of sound design. Think Dystopian environments, unexplored Science Fiction spaces, unsettling horror ambiences, signals gone awry, abstract textures and harsh walls of noise. Fun Casual Sounds contains over 600 professionally designed sound effects! A perfect collection of fun sounds suitable for all types of sound designers, video editors, game developers or anyone who needs a large range of high quality fun sound effects ready to use out-of-the-box. Great for both quickly prototyping and the finished product. Designed specifically for games, video and other media by award winning sound designers. This pack also includes a variety of 150 bonus sounds effects from our full library Pro Sound Collection. ALL sounds from Fun Casual Sounds are included Pro Sound Collection so if you need more sounds be sure to check it out before purchase. Baltic Forest is a collection of ambient recordings captured over one year in a private forest in Northern Lithuania. 53 carefully recorded exterior ambiences made during summer, autumn, winter and spring. From the bright sound of native birds in spring and summer, to the freezing cold (-20 Celsius) snow storms and tree movements of autumn and winter – sometimes recording in knee-deep snow. All sounds were recorded and edited at 24-bit / 96kHz, with embedded meta data. Comprised of five heavy hitting libraries, this bundle includes GEARBOX, SORCERY, HERO, BROKEN, and MELEE. Save by bundling all FIVE in a single library. 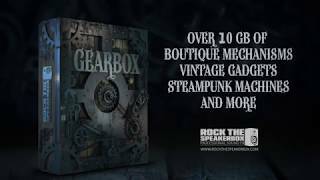 Boutique analog mechanical contraptions, steampunk gadgetry, gizmos and machines big and small. Spells, deflects, casts, blocks, beams, and more. Unrivaled wizardry at your fingertips. Car crashes, explosions, crumbling buildings, earthquakes, ripping earth and metal, to debris, and more. HERO – Sword fights, stabbing, guillotines, impaling, battle cries, shields, drawbridges, armor, foley and more. Punches, kicks, blocks, bodyfalls, grabs, slaps, bone breaks, blood splatters, and more. The World War II American M16 Halftrack anti-aircraft sound library features 313 sound effects in 18.86 gigabytes of audio. Based on the M3 Halftrack, this “multiple gun motor carriage” showcases 20 takes of up to 42 channels of performances from a White 160AX, 6-cylinder, 128 horsepower engine. Twelve onboard perspectives present the vintage vehicle in slow, medium, and fast speeds with steady idles and ramps. The twelve exterior perspectives include 26 channels of the halftrack starting, departing, passing, reversing, and arriving. Includes over 18 fields of Soundminer, BWAV, and MacOS spotlight metadata. This SFX library features 217 sounds processed by a mint condition Chorus Echo RE-501, including metal impacts, church bells, chainsaws, voices, and water. In addition, self-oscillation sounds from the RE-501 are included. The combination of the 192khz high resolution sample rate and the tape saturation/warmth from the Chorus Echo make these samples sound great when pitch shifted and/or time stretched, even at extreme settings. New sound effects: Cars and bikes, mechanical contraptions, museums and more!